During N19eteen 86's inception, they completely renovated a building and built a brand themselves. Though, they opted for Smart Creative's expertise in menu cover design and design refreshing to match the quality of their graphics with the quality of the venue. With Smart's help, they were looking to continue the feel of their casual bistro bar right through to their menus. First, we set to the task of recreating their hand drawn logo into a workable design. This embodied redrawing the logo digitally and converting it to a vector format. 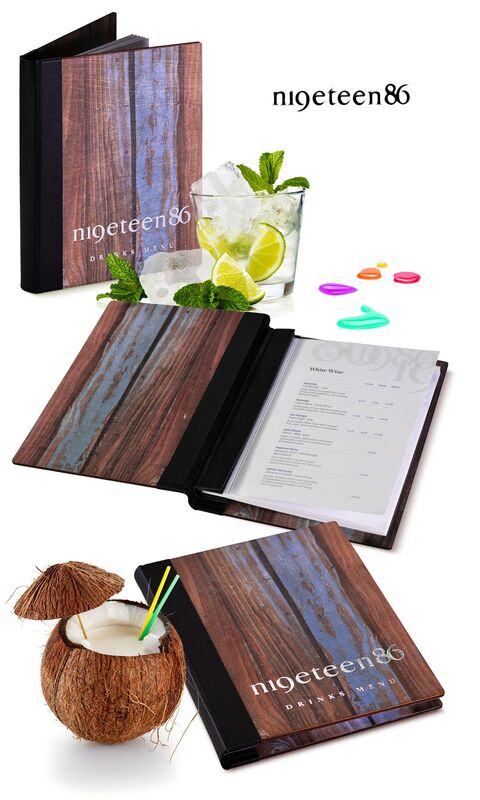 With this file, N19eteen 86 are able to use and print their logo anywhere, no matter how big or small. By giving them this professionally finished logo, we were able to spur them and ourselves on in the development of this new business. With the logo in place, the menus were the next item to tackle. By understanding the feel that N19eteen 86 were looking to create within their venue we were able to put together ideas of what it should look like. To match the contemporary industrial vibe, we chose a digitally printed wooden menu cover, printed with a rustic wooden texture to add colour. This, along with the stylish black spine makes the menu fit perfectly within its surroundings.